Well, happy Wednesday to you all! I hope that you are well. For my part, I am back at work after my snow day yesterday. I am feeling decidedly sleepy and wishing that I was back at home sipping tea and watching Team Umizoomi with Anne rather than preparing for a reference shift. As well, every muscle in my body is aching for my foray into a Hipfit class on Monday night. It was incredibly fun though. I do need to be CAREFUL, however, because that muscle in my left leg is feeling a bit sore again. This is the one respect in which I hate not being 20. It's so much easier to injure yourself the older you get. And by "injure yourself" I mean that when you're 20, you may injure yourself playing rugby or having a trampoline jumping competition. When you're 40, you injure yourself by stepping the wrong way when you walk down the stairs. Not fun. And with all of the dancing and fitness stuff that I enjoy, when you injure yourself by walking down the stairs, you can very easily aggravate things via a spin sequence or jumping around too much. Oh the woe. Thus, it was nice to take it easy yesterday. Although granted, I did go outside to help Mike shovel snow because I wanted "to get steps in" on my Fitbit. I am ridiculous, I tell you. But I drank lots of tea and coffee, and I did lots of knitting. So, my Downton Abbey mystery craft-along progress is going slowly but surely. I wish I was keeping up with the speed at which the clues came out each Sunday, but I realize now that by taking on both the knit-along AND the crochet-along there was no way that was going to happen. Hindsight is indeed 20/20. And in a sense it's good, because in many of the weekly clues updates were made after they were published, and I got the benefit of not having to be confused and rip out rows due to minor errors in the original clue. So, we'll take it. I've put the crochet version aside for now to just finish up the knit clue, and then will go back to the crochet shawl when I'm finished. I can tell that I have more momentum when I just stick with one version, and I *really* want to get these girls finished. I'm enjoying working on them, but I have other things in the queue that I'm anxious to get to. That's the center back motif, plus a single side wing. 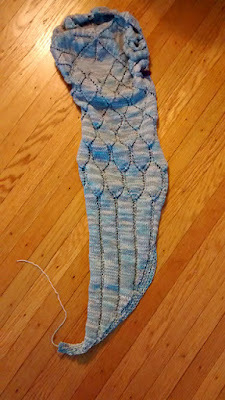 I also started clue 5 yesterday, and we've picked up some reserved stitches along the other side of the motif, and have re-begun the lace pattern for the second wing. Clue 6 is the decrease section for the second wing, and then clues 7 and 8 are still a mystery to me. We're getting there! I started my second skein of yarn, so I do feel like I'm making good progress. How are your Downton Abbey shawls going? Are you working on any other winter craft projects? I'd love to hear all about them! Tomorrow, we'll have tea time. Next week I'll indeed have a Lenten book review, which will be of Jeff Cavins' When You Suffer: Biblical Keys For Hope and Understanding. If you're reading this book too, I hope you'll join in! I finished clue 3 for the shawl and started on clue 4 but I'm only a few rows into it. So seeing your clue 4 gives me and idea of what I'm working toward. My aunt came over this weekend and asked me what I was knitting. I told her it was a shawl. Apparently my cousin had been over earlier and saw my knitting sitting on the couch (I wasn't home). My aunt said my cousin had thought it was beanie because of the string in the middle. I was impressed with that guess since my cousin knows nothing about knitting and I'm sure you could use that cast on for a hat. Hi Melanie! Indeed, this (pain in the *!# :0) cast on can be used for anything started in the round, so it could be used for a hat wherein you begin at the crown. Clue 4 is infinitely easier than clue 3 because you're constantly decreasing, so it goes somewhat faster. These clues seem VERY long this year, I do not remember this from last year's MKAL. I noticed in the clue 7 message that just came out, she said that the final two clues are very short. To me, I would rather have had them be more moderately sized throughout, but at least we know there's a light at the end of the tunnel.